On the other side of the mountains from Central, the small town area of Aberdeen has grown from humble origins. Famously the ‘Fragrant Harbour’ from which Hong Kong gets its name, it now has more land than it did when the first British boats entered the port. Land reclamation has given the area more space for residential and commercial purposes, but it has also changed the alignment of the town. The smell of incense remains in the Fragrant Harbour, but it comes from the many temples of Aberdeen rather than from the raw commodity being transported to China. 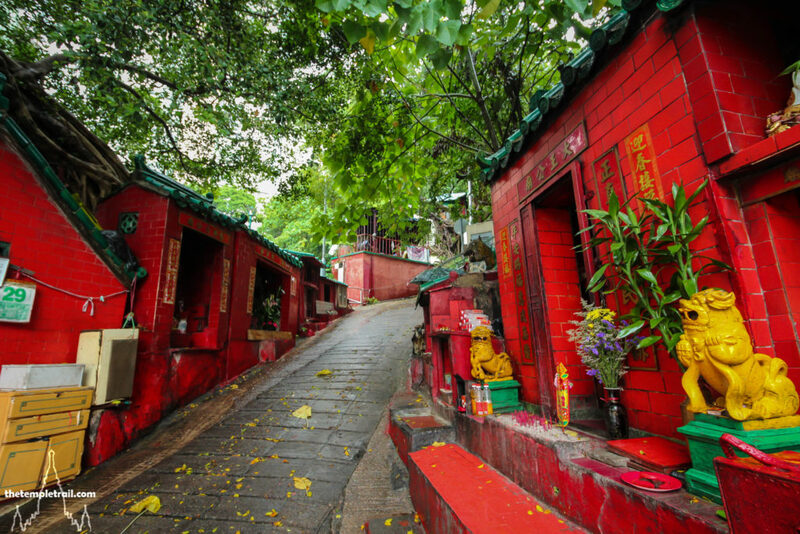 The wide Aberdeen Main Road acts as the artery of the settlement and at its end is the famous Tin Hau Temple (天后廟 Tiān Hòu Miào), a protected heritage site. Across the bay in Ap Lei Chau two other temples, dedicated to Hung Shing (洪聖 Hóng Shèng) and Kwun Yum (觀音 Guānyīn) respectively, are similarly preserved. 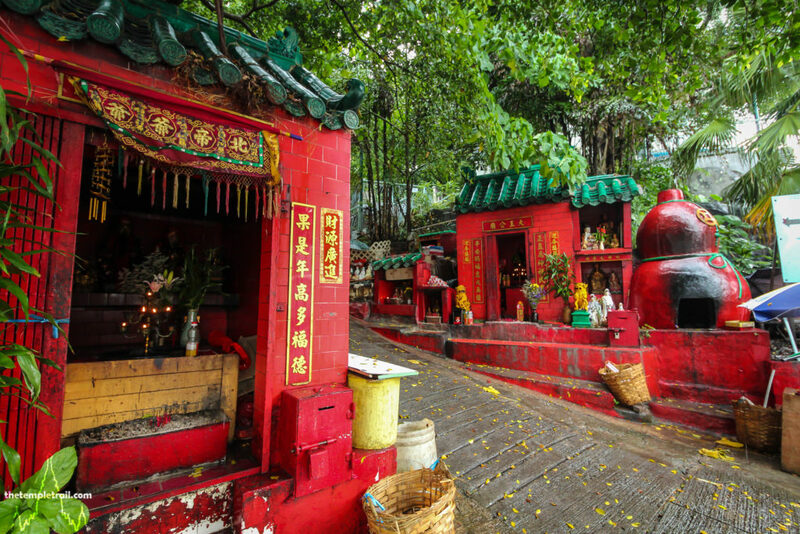 While these are three fabulous temples, a small cluster of shrines deserves its place among the unique temple spots of Hong Kong Island. Before the land reclamation, the main thoroughfare of Aberdeen was what is now called Old Main Street. This sharply inclined and meandering road climbs up through the older part of Aberdeen and runs parallel to the newer Main Road. At the foot of the street is a group of shrines that are dedicated to various gods and once served as the first place one had to pass through when entering the village. These old god shrines still look after the area and are the guardians of Aberdeen. All the familiar faces can be found, plus a few not so common ones. 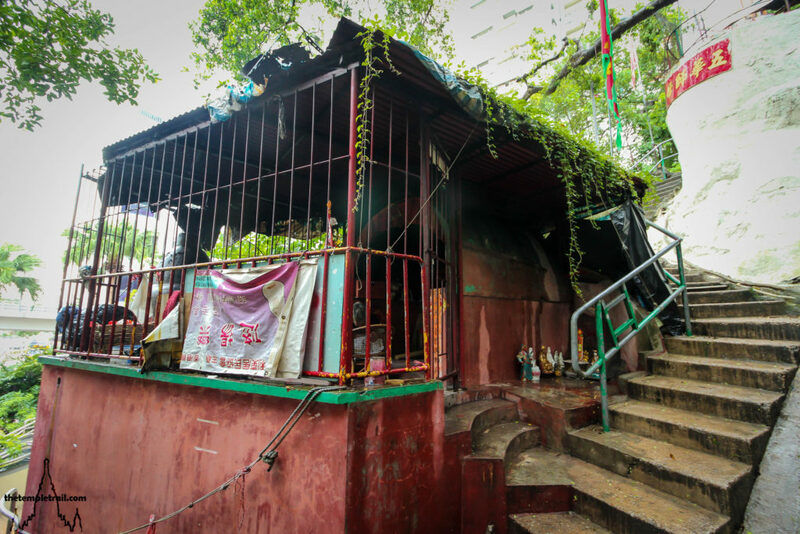 If you stand at the mouth of the street, you see an array that not only includes the shrines, but also a large gourd-shaped furnace for burning joss paper. On the left hand corner of the road is a shrine to Pak Tai (北帝 Běidì), the Northern Emperor. He is a winter god, as he is the Supreme Ruler of the Jade Void. The shrine is one of the largest and is similar to a standard temple in design. Hung Shing has a shrine called Tai Wong Kung Miu (大王宮廟 Dà Wáng Gōng Miào). The raised temple has an incense brazier before it and a pair of guardian lions. The sea god’s shrine is surrounded by a few others. All of the small shrines call themselves temples (miu), but that seems a bit of a stretch. To the right of Tai Wong is a shine to Dei Mu Yun Gwan (地母元君 Dì Mǔ Yuán Jūn). This is an unusual figure and not normally found around Hong Kong. Her name means “Original Earth Mother Goddess”, but the more familiar Earth God, To Dei Kung (土地公 Tǔ Dì Gōng) also has a shrine in the cluster. 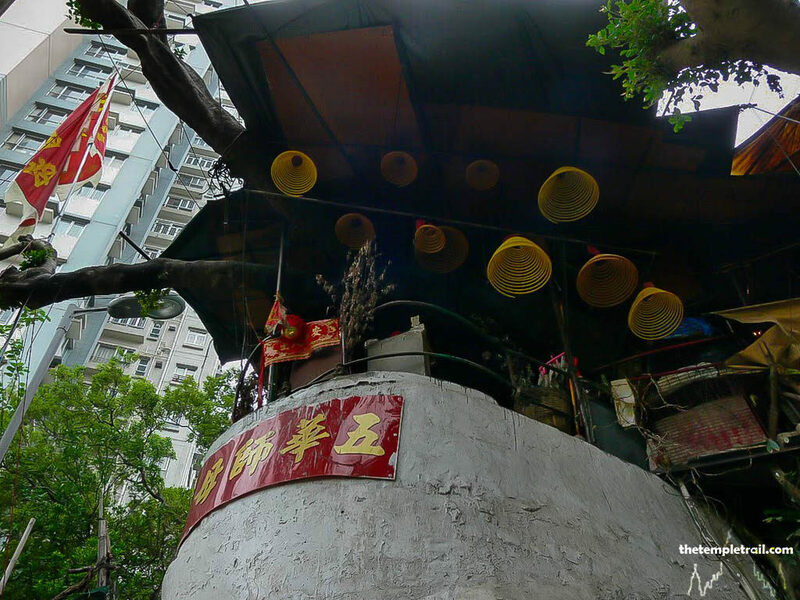 Shrines to Wong Tai Sin (黃大仙 Huáng Dàxian) and Tin Hau (天后 Tiān Hòu) occupy the lower levels on the left of the Hung Shing shrine and above them is a large tiger statue that represents Bak Fu (白虎 Bái Hǔ), the White Tiger God who can dispel curses and keep evil forces at bay. 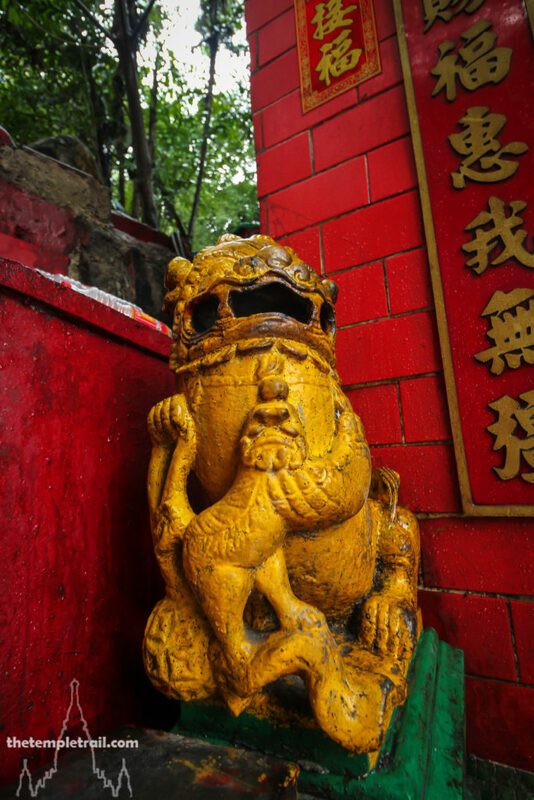 Behind the tiger is a small shrine called San Bak Miu Tong (山伯廟堂 Shān Bó Miào Táng), literally, Mountain Grandfather Temple. 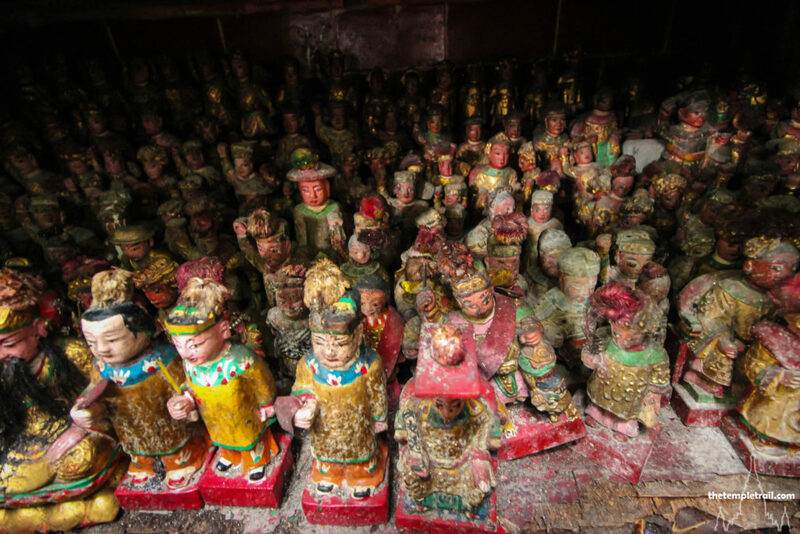 Inside the tiny space are a number of mysterious gods wrapped in cloth, much like at the Sam Yi Gwan Miu in Lan Kwai Fong. On the other side of the Road is a shrine called Yong Shu Gong Gong Miu (榕樹公公廟 Róng Shù Gōng Gōng Miào). This means Banyan Grandfather Temple and seems dedicated to the old banyan tree that grows next to it. Inside, a number of Buddhist statues can be found and in the centre is Tei Chong Wong (地藏王 Dìzàng Wáng), the Earth Treasury Bodhisattva, who is responsible for the dead. 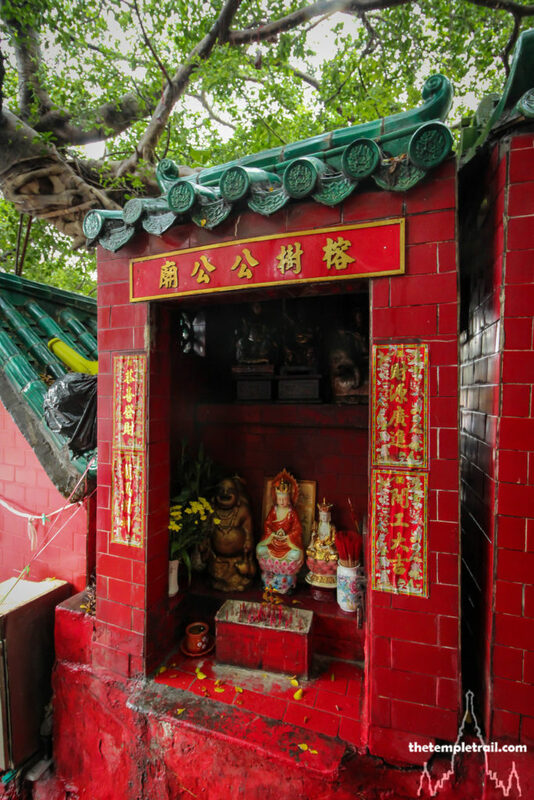 Next to this is a shrine for Kwan Tai (關帝 Guān Dì) and Kwun Yum followed by two unnamed shrines with multiple gods inside. At the top of all of the shrines is a temple that seems always to be locked. Overlooking the old shrines is a temple on small plateau. This later addition is dedicated to a goddess named Ng Wa Si Mo (五華師母 Wǔ Huá Shī Mǔ). The goddess is said to have appeared in Aberdeen in the 1990s and is said to be a doctor with the ability to heal. Apparently, lightning struck and left 11 god images on the ground. The ramshackle temple was built by the locals to house a few shrines to these gods as well as the new local goddess. A patchwork roof used a tree for support and joss coils smouldered away under it until a fire caused the roof to be removed a few years ago. These shrines on Old Main Street are not normally on the map for visitors and are usually no more than a footnote in any guidebook. There is almost no information available about their history and a comprehensive study and discussion with the temple keepers and locals would make for interesting reading. Sites like this, while popular with locals, are at the highest risk of destruction due to their hodgepodge nature and unknown provenance. 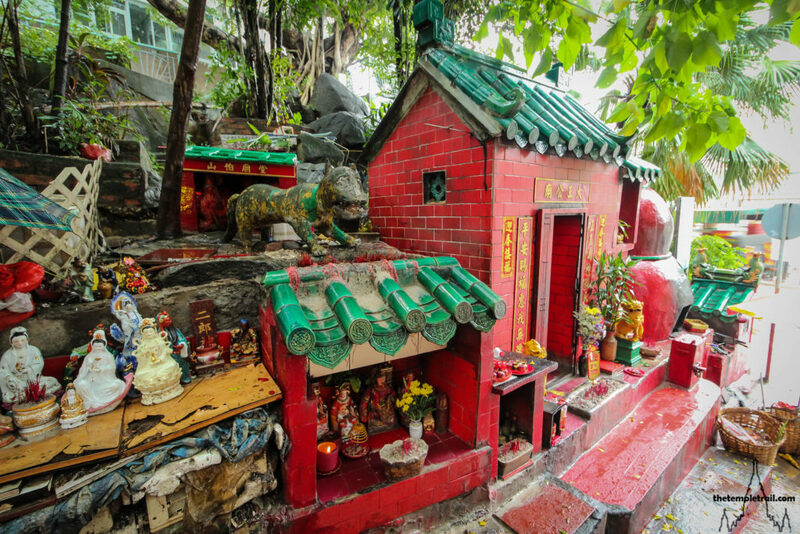 This place deserves more recognition from visitors and shows the unique nature of the Chinese Folk Religion in Hong Kong.